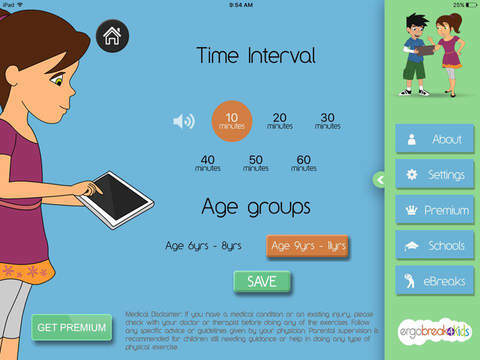 This app teaches children how to use technology without harming their health through poor posture and overuse. To help them remember and employ what they learn, Ergobreak 4 Kids prompts them to take an Ergobreak at user-defined intervals. Since technology began to permeate every aspect of our lives, we've found that the benefits can be dampened by the problems. Employers have a duty of care to ensure that employees' health is protected while working. Sitting at computers and hunched over tablets can have a health cost and many responsible employers will offer guidance and advice to minimise the risks. But what of our students? Children are spending increased amounts of time using computers and tablets at school and, for both work and pleasure, at home. The creator of this app reasons that schools should be both ensuring a healthy use of technology at school and embedding a desire to do the same at home. The reasoning is sound. If it is important enough for employees, surely it is important enough for our still growing students. Designed by a health and well-being expert, this app meshes the solution to the problem with the cause - the device itself. Within the app, at the time of writing, are twenty videos describing useful exercises to counteract the postural problems that might emerge after prolonged use. These videos are made with excellent production values. They display clearly and effectively how to do the exercise using another child as the teacher. The app isn't just a container for these videos, it also works to embed them in children's use of technology. The app can be set to prompt the user to undertake an exercise after a set period of time, and being wireless, it doesn't need to be connected to the internet at that time. A potential sticking spot for new users might happen before they even open the app. The app can only notify users if notifications are allowed. Many of us are conditioned to hit "no" at this point but the habit must be held in check for this app. Rest assured that it does not engage in the pointless notes you are trying to avoid, the function is used only to prompt an engrossed student to begin an exercise. The app is otherwise easy to set-up and smooth and intuitive to operate. It will disappear into the background while the device is used and then emerge when the time is right. As well as helping posture, the exercises will also enliven and refresh students who may be flagging. If the app delivers its content efficiently and easily, what else is there to consider? Essentially, it comes down to your own feelings on the problems it aims to solve. The app's website offers many links to research on the subject to help you form your opinion, or if you are sold, to help you justify it to your school's staff and students. And this is something you must do to give it the chance to succeed. It is an app that needs to be adopted and used across the school for it to have its desired effect of embedding a healthy approach to using technology. If you have seen children rubbing sore necks, looking up with bleary eyes and you blame the technology, then this app is the solution for you and for them. Is your child glued to technology? Are you concerned about your child’s health while using technology? Employers think carefully about staff welfare in regards to workplace health with technology, but what are we doing about children's? Ergobreak 4 kids is the fun, engaging way to teach 5 -12 year olds how to stay healthy while using technology by regularly prompting children to use the app’s ergonomic tips and exercises. The Ergobreak pop up window includes a stretch exercise ensuring key developing muscles affected by poor posture and overuse stay healthy in the home or at school in the classroom. 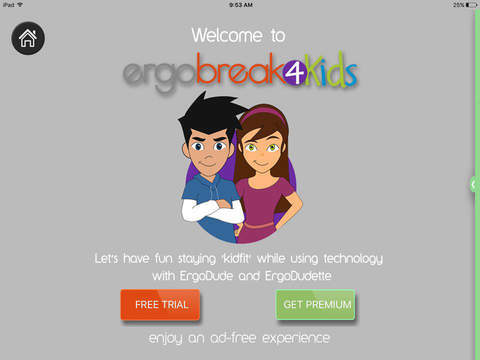 Ergobreak 4 kids also has fun, comical animated characters ErgoDude and ErgoDudette teach children ergonomic tips. Ergobreak 4 kids offers a FreeTrial which shows 3 Ergobreak exercises and a Premium Subscription which has the complete 20 Ergobreak exercises with ergotips. We at Ergo Productions endeavour to develop Apps that keep your children ‘kidfit’ whilst using technology. - Parents you can have fun doing the stretch exercises too! Ergo productions is a Sydney-based creator with international designers and developers. A team dedicated to the best, healthy educational apps for kids. We hope you enjoy Ergobreak 4 kids it has been a fun creative journey. As a parent, Ergo Productions takes children’s wellness and privacy seriously. We do not collect or share personal information about your child. We do not allow any third-party advertising.